This moisturising hand wash is tough on dirt but gentle on hands. Contains sea buckthorn extract for its natural cleansing and exfoliating properties. A graceful fragrance of light fruits leading to fresh flowers and warm woods. 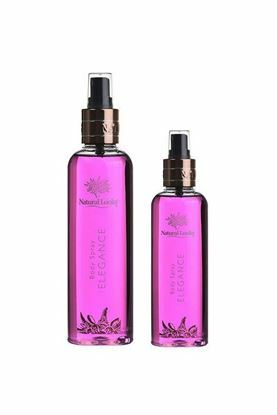 An infusion of elegant romantic fragrances of light fruits leading to fresh flowers and warm woods in a refreshing fine mist. Designed to cool and perfume the body without drying out the skin. Handy sized, non-sticky, roll-on deodorant designed to give all day freshness with an elegant refreshing fragrance of light fruits leading to fresh flowers and warm woods. Contains sea buckthorn extract for its antioxidant, soothing and healing properties. Directions: Shake before use. Apply underarms after cleansing. Do not apply to broken skin. A graceful fragrance of light fruits leading to fresh flowers and warm woods. Beautiful presentation box makes this an ideal gift . A free perfume bracelet is included in carton whilst stocks last. A rich moisturising and hydrating lotion which is packed full of natural oils and extracts including sea buckthorn which is well-known for its rejuvenating properties. Fragranced with a graceful blend of light fruits leading to fresh flowers and warm woods.